The perfect fall foliage photo. I’ve been making autumn photographs for years and have never been completely satisfied with the results. Color in itself is not a particularly good subject so a photo with a mass of brilliant foliage, for me anyway, really isn’t much to write home about. My “curve in the road” photos, I think, are better because they are designed to entice the viewer to wonder what beautiful foliage might be seen around the bend. Artistically, it should show off the brilliant oranges, golds and reds of the season which means that the subject should be well lit. The subject should be interesting without the color. There should be an interesting foreground that leads the eye to the subject. The sky must have some blue in it. Puffy clouds in a blue sky make the sky more interesting. A washed out sky sends an otherwise nice photo to the trash bin. It must create the appearance of three dimensions in a two dimensional medium. It should create a desire in the viewer to want to see the sight in person, again and again. Technically, everything should be in sharp. That means small apertures and fast shutter speeds, especially if there is any wind. Nothing should be cut off. Tops of trees should have some room above them. The subject should be placed for eye appeal. There shouldn’t be any distracting elements in the photo and there can be no intersections such as foreground branches crossing over the subject. Horizons must be level. While I'm not saying this is a perfect shot, I think the photo below that I made in the Harrison Hills of north central Wisconsin earlier this week meets my criteria for a pretty good photo. I personally think it is my best fall foliage photo. Feel free to add any comments about what it takes to create the perfect fall photo or about this photo. I considered removing the twigs rising from the trees on the left and the twigs on the right. It just didn't look right if I cloned out the rising twigs. And frankly, less than perfect in nature is more likely. Last edited by autzig on Fri Oct 17, 2014 1:08 pm, edited 4 times in total. Re: The perfect fall foliage photo. I agree with your assessment of the photo. It ticks all of the appropriate boxes. I do however, prefer "story" photos in keeping with your thinking around the "curve in the road" shots. I love those photos because there is an implied "journey" to them. Same reason I love a photo with some kind of structure in it. "What is the story behind that dilapidated house or barn, etc...?" I definitely like layers. I love a great majestic shot where there are a succession of ridges off into the distance creating that depth and 3D feel. Color is critical but my preference is still for an idealized realism and not the over saturated, almost cartoonish treatment so prevalent. I really like your picture because the colors on the trees on that island are right up against what seems the maximum possible in nature (again, idealized realism). If I have any crirticism of the shot, it is that I am not in love with the deep red foliage to the left. The leaves that are at a certain angle have a bit too much reflection and make the light seem hot. I love the other colors and the effect of the light on them so I am probably just being nit picky. Overall, I love it. Thanks Dean, for taking the time to comment on this photo. I noticed what appears to be a glare off the sumac leaves too. I was using a polarizing filter, so there shouldn't have been any. Maybe I've shot enough curve in the road photos that I needed a new perspective. I hope a viewer who sees this photo in the dead of winter or sweltering summer would think, "I want to be there right now." I know I'll think that. It was such a beautiful day, I will have fond memories of it. Unlike any other viewer, I will remember the smell of the autumn air, the warmth of the sun and the effect of a slight breeze. Dear Al, thank you so much for this post, I really enjoyed what you and Dean said as I'm learning more about the importance of composition. I too love a photo that draws me in, makes me want to walk down that road or meander around that barn and see the rest of the country side or tells me a story. I love too, for those that were there or would like to be, it ivolves more than sights, but smells and feelings. In this photo, for my eye, I do find the sumac leaves a little harsh, otherwise it is beautiful. It is interesting how different eyes see things differently. I don't even notice the sumac. My eye is immediately drawn to the trees on the right. By the way, Janice, I didn't get my Moab trip in this year because of a death in the family. I am planning to shoot Zion during the first week of November, if it is open (Arrrgh). Otherwise, I'll be running around southern Utah. Any out of way places you would suggest? I'm thinking the Pink Coral Sand Dunes, Snow Canyon and even the Valley of Fire in Nevada. I'd appreciate any suggestions. Hi Al! I ment to ask you why I had seen any picks of your Moab trip. That was a very stormy time in southern Utah anyway, in Nov. You just might catch a little snow on those red rocks, and that makes for some beautiful pics. I don't know how much time you'll have or how much driving you'll want to do, I love Pink Coral sand dunes and Snow Canyon other favs are Bryce Canyon, Cedar Breaks, Goblin Valley and Dead Horse Point. I haven't been there but my brother took some awesome shots of the Wave I believe in Zions. And lucky you all the parks are opened for business! Al: I waited a long time to put my two cents in. I kept coming back and looking at it. Until this trip, I just couldn't see it. It didn't - in the words of a guy from the 30's "send me." I still would challenge your suggestion that it is your best ever foliage photo (I have seen a lot of your work and I am pretty sure I can find some images that many, if not most, would think are "better" than this one). In my opinion, it doesn't represent your best work - which is very, very good. But it has grown on me as I keep coming back to it. And, of course, one of the beautiful things about art is that we don't have to agree and that doesn't make an image "good" or "bad"
This won't come as a shock to you , but If I had this image, I would probably post process it pretty hard in Viveza2. This is an image that, in my view, would look "better" with some adjustments, making the sky deeper and more dramatic, toning down the sumac bushes, and perhaps even the overal brightness of the image. I have been hesitant to say anything - but then I realized I am breaking my own rule, and we are friends that mutually respect each other and our friendship is strong enough to "disagree" on things . So there is my 2 cents. If it sounds too good to be true, its probably . . . .
Andy: Thanks for your comments. I've always felt that I struggled with getting good foliage shots. Color should make otherwise nice shots even better. I think your shot at Craftsbury Commons exemplifies that idea. I focused on the "curve in the road" concept to make better foliage photos. Sometimes I applied the same concept replacing the road with a stream. On one of my trips to Vermont, I bought some cement worker's boots at Home Depot so I could wade into streams to get the photos from the stream rather from the bank. While I liked many of those photos, I was never completely satisfied with them. Maybe this isn't the perfect foliage photo, but for me, anyway, it is the composition that I really like. Both you and Janice commented about toning down the sumac leaves. Interestingly, I've reworked this shot a bit. I shot in camera raw, of course, and the sumac is that bright right out of the camera. For my eye, the brilliance of the sumac doesn't detract from the photo at all. We all view art from different perspectives and when it comes to foliage photos, this one is more satisfying to me and any of my others. I am certainly not offended if you think I've done better work. In fact, I feel complimented. Janice: I guess I'll be shooting Zion in November but I do have a couple of extra days. I might try the Pink Coral Sand Dunes and certainly Snow Canyon. I've not been to either of them before. I'd like to get to Cedar Breaks but the weather is kind of iffy at that time of the year. I've tried to go there a couple of times before but the roads have always been closed. I'm familiar with the Wave. I think it is close to the Arizona border and you need a good 4 Wheel drive vehicle to get there. A permit is required and they hold a lottery for daily permits months before the entry date. I've been to Zion, Bryce, Capitol Reef, Natural Bridges, Monument Valley, Canyonlands, Arches and Dead Horse Point, some of them many times. I have yet to get to the Goblin Valley so I will have to return to Utah to see that. There is simply no place in the world like Southern Utah. I never tire of it. So, Al: How about posting before and after images? OK Andy, here are the before and after. This is right out of the camera with no post processing except to resize it to fit on this site. You can even see the telephone wires. Thanks, Al. Need to wait until I can see this on my color corrected monitor. Would you be willing to share with us what you did from out of the box, to the final result? Especially since I am still "evaluating" the NIK software, I am interested in what workflow you did with it - if any. I opened the file in camera raw and made some minor adjustments there, employing the profile for my lens, saturating the blues a bit, adding some clarity and little vibrance. I opened the image in Photoshop where I removed the wires and fixed a couple of dust spots. Then, I copied the layer <CTRL J>, converted it to a smart object and opened the Nik Color Efex Pro. I applied the default Details Extractor filter, I added the Contrast Color Range Filter applying the yellow green filter. I increased the color from the default to 207 degrees. I used the control points to remove that filter from the orange tree on the right. I’ve never used that filter before but I thought it worked quite nicely here. Lastly I applied the Pro Contrast Dynamic Contrast filter. That’s it. I didn’t apply any other filters or Photoshop layers. One filter that I didn’t use but maybe should have is the Darken/Lighten Center. This filter creates an almost imperceptible vignette. You can control the darkness and lightness of the border and the center. You can also place the center where you want it and control its size. I actually added this filter as I was working on this description and I think it makes the shot even better. I did use a control point to eliminate the darkening effect on the sky. Based on your and Janice’s comments, I masked out the Nik filters from the sumac leaves on this version. Al, everything you said was all mumbo jumbo to me! But the first thing I noticed was the darker water, gives it nice depth and contrast, I like it! Overall, I like this photo Al and I am smiling as i read about your adding a bit of saturation (given all the debates you and Andy have!) I am ambivalent about the Sumacs..... my eyes are drawn to the beautiful trees and I really like the leaves in the water...I also wonder what is directly to the right of the trees. Thanks for sharing the photo but also your thoughts about what you like, why you like it, why it meets your requirements for a great foliage photo, etc. It is always helpful when excellent photogs like you share your thinking about the photo, the process, etc. Al: Thanks for the rundown. Funny, but the image you put here looks different (better to me) than the "after" image in the preceding post. Wonder why. I was really interested to see what you were doing in Nik. For those who maybe haven't read other threads here on this topic, Nik Software (now owned by Google - what isn't these days ) is a suite of software that are add-ons to Adobe's Photoshop and Lightroom. The have a sharpening program, a B&W program, and a couple of enhancement programs. One, is colorEfex and it is essentially a large collection of "filters" (many of them mimic camera filters like neutral density, polarizers, etc., and others just allow or create special effects). The other enhancement program is Viveza (now in its second generation, Viveza2). Nik uses a technology that does something very similar to feathered masking (except that everything gets done by a circular mask referred to as a control point. There are sliders that allow making adjustment and also making each circle smaller or larger. Every Nik module has them. But they act differently. Viveza has basic adjustments like contrast, saturation, brightness and shadows. I find that I like it best and it is my "go-to" program now for any color enhancements. Al, OTOH, uses ColorEfex for most of his adjustments. To a large extent these programs allow similar results. There are a couple things I use ColorEfex for because it does it better than I could do with any other adjustment or program (the primary one is the graduated neutral density filter). Interestingly, I think I could achieve a similar result using Viviza, but the workflow would be slightly different. Bottom line, I like what you did with the final result and I think it makes a much more pleasing image. The draw, to me, of this image is the complimentary variety of textures and colors and I think it needed some "in your face" tweaking, which Al does really well - probably more subtly than I do . I am curious, Al, though - how do you saturate the blues in ACR? Based on my study of Jeff Schewe's book, "The Digital Negative" I don't use the saturation slider in ACR at all. The only adjustments I make that could affect saturation are Clarity and Vibrance. Any other saturation is done in Viveza, or ocassionally in ColorEfex. 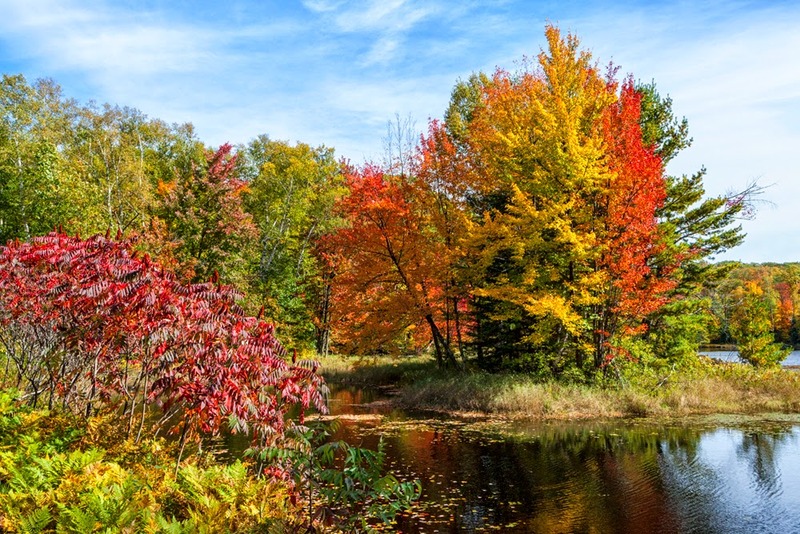 Topic - The perfect fall foliage photo.